Spicy and creamy, this Warm Gumbo Dip is perfect from shrimp lovers. Alongside the shrimp are sauteed bell peppers, garlic and okra. Bake it up and serve with a sliced baguette. If you aren't a fan of okra or can't find it locally, you can feel free to leave it out. I think the addition of 1/2 cup of shredded cheddar or colby would be a tasty addition to this. 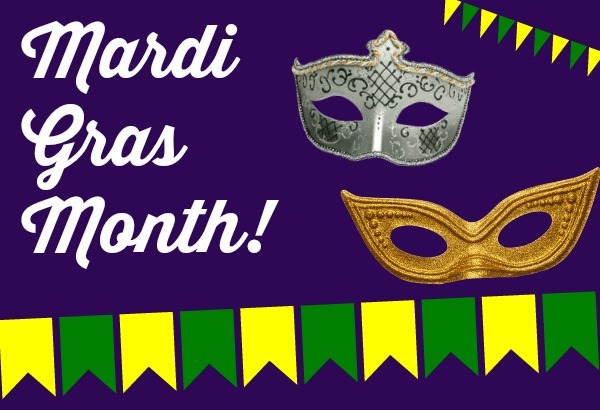 February is Mardi Gras Month here at Jam Hands. There are lots of recipes for you to check out and enjoy. Preheat the oven to 400˚ F. Melt the butter in a large skillet over medium-high heat. Add the bell pepper, okra, and celery to the pan and sauté until beginning to soften, about 6 minutes. Stir in the green onions, garlic, and Cajun seasoning. Cook 1 minute more, just until fragrant. Stir in the shrimp, cream cheese, and Parmesan. Stir over low heat until the cream cheese is melted and everything is evenly mixed. Spoon the mixture into a baking dish. Bake for 25-30 minutes or until the top is browned and bubbling. Serve warm with toasted baguette slices. Slightly adapted from Myrecipes.com and Annie's Eats.